LICH in the balance. Nine proposals presented at St. Francis College this evening. As was announced during our March meeting (last night, post to come), concerned residents of Brooklyn can visit St. Francis College tonight (180 Remsen Street) for a public presentation of the 9 proposals for Long Island College Hospital LICH). The session is slated to begin at 6 pm and is being run by 7 community organizations including the Cobble Hill Association and CGNA. 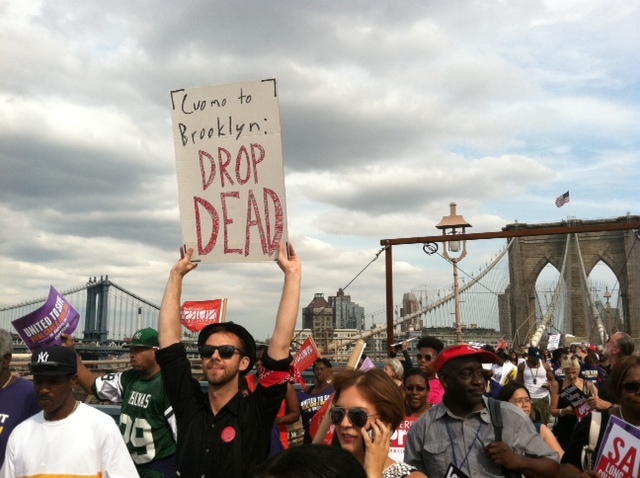 Many of our Brownstone members have supported the legal fight vs. approaches of NY State all along, and certainly will attend — as this issue is essentially ‘life or death’ to many 100,000s of residents, visitors and workers across Brooklyn Heights, Downtown, Red Hook and Brownstone Brooklyn. Our hospital has been here for 150 years, and ahead of the Bridge – and Brooklyn itself was designed with it as a foundation. It’s a vital part of our community and its well-being/healthcare, and was a ‘teaching hospital’ until beset by NY State mismanagement (recently). Baby boomers getting older is fact of American life. We will lose untold neighbors of LICH is allowed to fall to the highest bidder. The community wants a FULL SERVICE HOSPITAL — like what had existed before State agencies began managing LICH into the ground, seemingly in order to capitalize on its real estate. Even with the $8 BILLION that’s come back to NYC for the health of our hospitals — NY State had chosen to sell the real estate in Brooklyn Heights/Cobble Hill last year — instead of looking for a suitor to run it as a full service hospital. The New York Times has taken the bait, and supported the NY Governor’s and SUNY’s management claims – without exposing the truths that any one of a million Brooklyn residents, here can relay. Now, we are on the clock for the “best” proposal. Our statewide elected officials (Democrats we won’t name, here) are selling out of People — and this “achilles heel” may the best hope of Rob Astorino to win the Governorship. Thus far he has been silent — most probably because our Party has overlooked the impact of a MILLION RESIDENTS/visitors/drivers on the BQE living each day within the region served by LICH. Add that many 100s of jobs (union jobs, at that), our local economy, the lives of our residents — all are ignored/belittled, despite the rhetoric of the Democratic Party. Elected officials (of our One Party System) that had been increasingly emboldened throughout 2013 — have been awkwardly more silent, now that the standard bearers of City Hall and Albany have reached an accord on how to streamline the process of sale? It’s been our collective position for well over a year, that NY State has sought to close the 150-year old hospital — employing private security to BLOCK the emergency room entrance, turn away ambulances (! ), using State agencies to bleed funds for years and actually ferry patients out in the middle of the night, on their beds. This is an issue that shaped the NYC Mayoral race last year when the Public Advocate (that hadn’t a record to run on, in four years and scant as a career politician) was able to gain traction by being arrested (on camera) while joining what many believed was his first rally to save the hospital in mid-July, 2013. He soared from 7% polling figures. 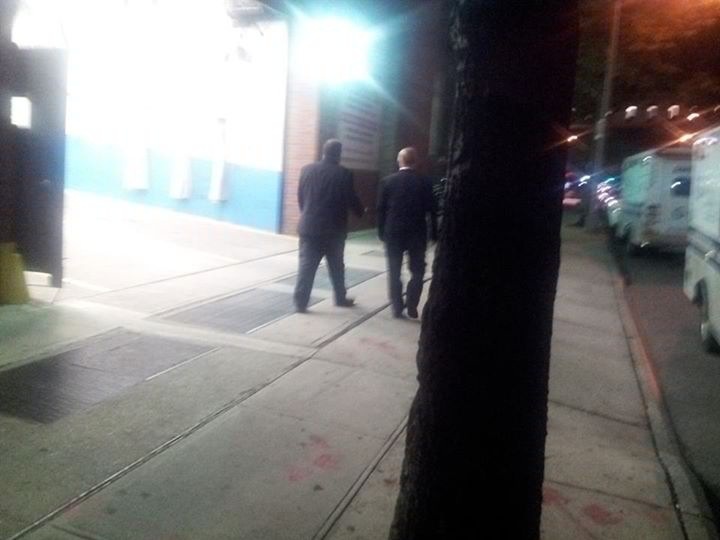 Candidates Liu and Weiner were also present, and were lost to history. They hadn’t seized the moment. Always remember, that late as 2012… fully 100,000 patients were treated through the Emergency Rooms of LICH.. and that the total population of Albany is only 98,000. 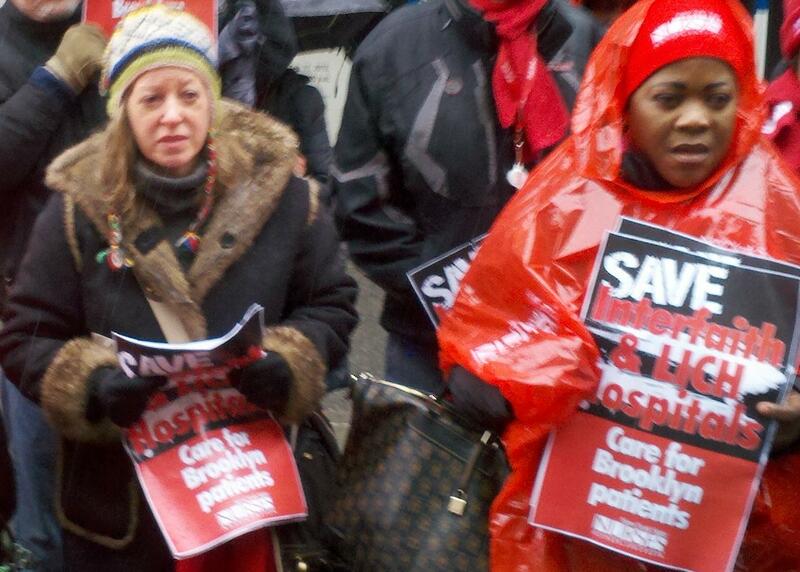 Tags: Brooklyn hospitals, Cuomo, LICH, Long Island College Hospital, One party rule is awful, Rob Astorino where are you? With Governor Cuomo assaulting the safety-net of healthcare and hospitals — from Red Hook to Cobble Hill/Brooklyn Heights through to the center of Brooklyn — 1000s of activists from the communities of Bedford-Stuyvesent and Downtown Brooklyn came together to demonstrate. Nearly 3,500 jobs are threatened at InterFaith and LICH, and earlier in the day letters were handed out by SUNY administrators at Long Island College Hospital (LICH) not to show-up for the next day of work. Defying court orders, SUNY each day seeks to cripple LICH, which last year attended to more patients through its Emergency Room (100,000) — than the total population of Albany (97,000). There have been 10 plans submitted to keep it running as a hospital — but the Governor seems hell-bent on selling the buildings (for unknown coffers). Yet? Gov. Cuomo still pulls the strings — and hides from answering to the millions of people served by these two hospitals. Our NYC media is drawn to demonstrations, but still doesn’t ask the NY Governor nor NYC Mayor about management of Public hospitals, with Public funds in the interest of millions of residents? 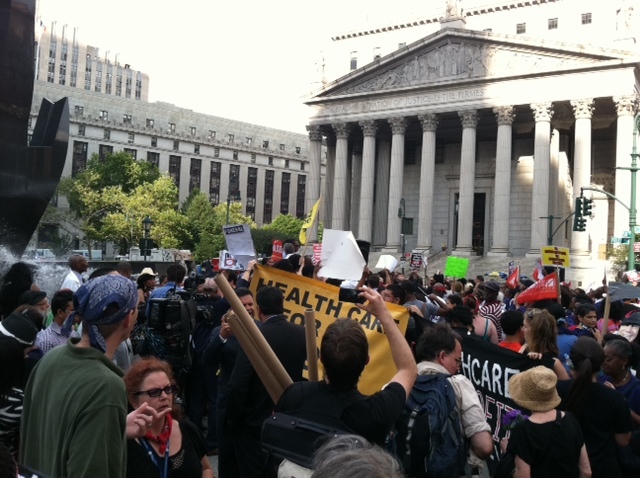 Community starts to Question Cuomo’s War on LICH. It was reported that each year 100,000 patients visited the Emergency Rooms of LICH or — more than the total population of Albany. 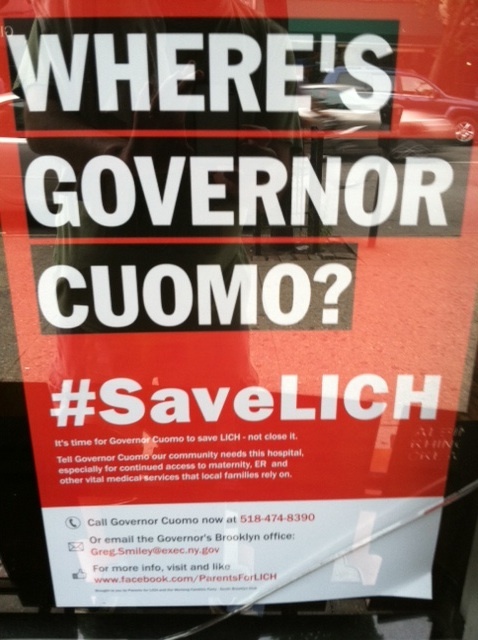 The communities surrounding Long Island College Hospital (LICH), a mainstay and safety net for 150 years — and starting to post signs wondering where (Governor) Cuomo has been hiding. State agencies like SUNY and Dept. of Health have been brutalizing this Brooklyn institution employing 2,000 and serving nearly 1 million residents and visitors. They both report to him. Many offers have been made by organization that want to keep it a working hospital. And yet… no response from Gov. Cuomo for why the 10 offers to keep LICH open? How can a Governor not visit to our downtown streets and hold no press conferences to explain what he has in mind? Local elected officials — all Democrats — seemed reluctant to speak His Name across 2013, but lately our State Senator, Assemblyperson, City Councilmembers, U.S. Congresswomen… are shut-out themselves from communication with a Governor that doesn’t at all seem to be acting in the Public Interest. At least 10,000 voicemails to Gov. 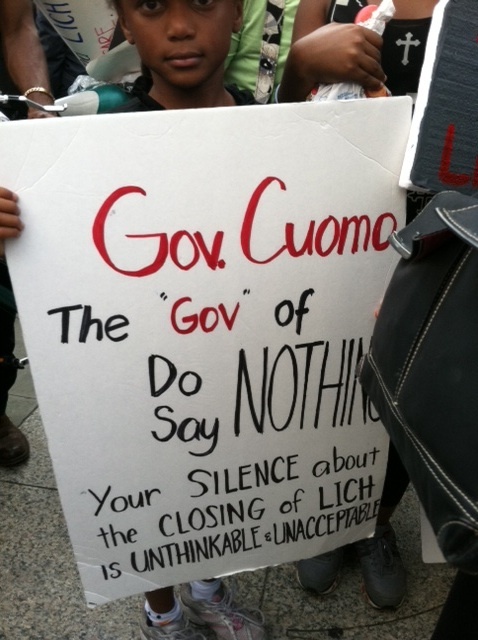 Cuomo, letters, protests have all gone unanswered. This is an issue of great importance across our areas, from Red Hook through Cobble Hill/Carroll Gardens, Downtown, Brooklyn Heights, Boerum Hill and around to the DUMBO area. Anyone can have a heart attack, get injured at any moment – what then? Yet, as LICH is controlled by SUNY Downstate… its been crippled as a ‘teaching hospital’ over the past 4-5 months. The Emergency Rooms have been patrolled by a State-funded (?) private security army — in Black uniforms — that chase would-be patients away, according to many at rallies. They patrol, and keep ambulances from entering. It’s more absurd each day. Yet, the NY Times chooses not to interview or question the NY Governor — about what threatens the healthcare of any of 100,000s of residents? what of the asthmatic children in Red Hook and families with seniors that need constant care? where are their stories — put to the Governor? 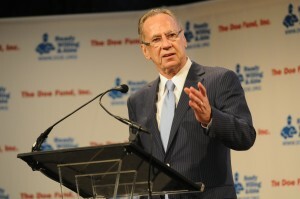 It seems there’s a WAR ON LICH — an everyday assault on the hospital by SUNY (which means Gov. Cuomo). And a blind-eye turned from the NY State Dept. of Health (which means Gov. Cuomo). The unions still seem to hold out hope that Gov. Cuomo will reverse his assault — for what many say is for the value of the real estate (large buildings in Brooklyn Heights/Cobble Hill) estimated at $1 billion. State Senator Squadron gamely asked aloud on the floor at Albany — if the sale goes through, would the revenue be dedicated for healthcare/budget in Brooklyn or NYC? Why is the real estate sale, more important people’s health? How has Gov. Cuomo been able to avoid outward criticism from NY Media (NY Times foremost) for openly putting so many middle and low income Brooklynites at risk? For over 6 months we believed that Gov. Cuomo is not only aware of the crisis — but has orchestrated it from behind the SUNY Board (as he’s appointed them, most notably its head, longtime Democrat Carl McCall). 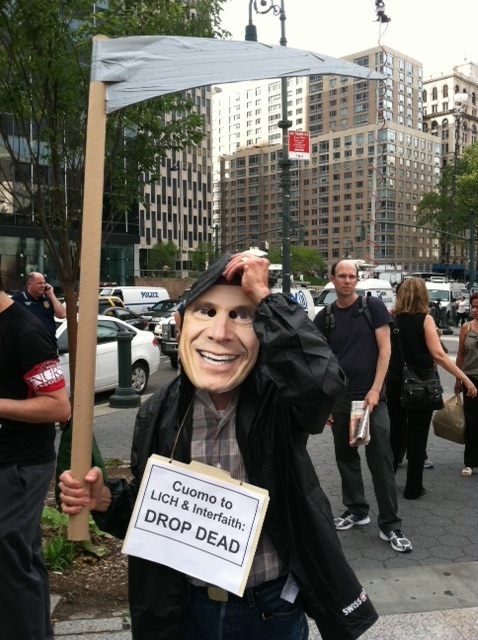 When will he answer to New Yorkers, about the many that wanted to BUY and/or MANAGE LICH as a hospital? why isn’t all this in the Public Eye and open/transparent? George McDonald Announces Support for LICH (1st Mayoral Candidate to Do So). 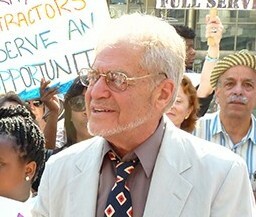 Republican mayoral candidate George McDonald announced his strong opposition to NY State government’s mismanagement of Long Island College Hospital (LICH) — which threatens the immediate care for 100,000s of patients per year from Red Hook around to Vinegar Hill, Carroll Gardens to all parts of downtown Brooklyn, and pink slips for 2,000 employees. Last Monday evening, George McDonald was guess speaker at the Brownstone Republican Club’s March meeting and listened to our concerns, updates and positions regarding what seems a higher valuation of the real estate of the physical building by the State group of SUNY officials now charged with its (mis)management, then the actual institution’s care for millions of Brooklyn residents. Today, LICH provides a safety-net of medical support for over 2 million residents. During the meeting, BRC president Joe Nardiello reinforced both the history and vitality of LICH – and opened discussion to the general meeting attendees for their concerns, support, thoughts on the matter. For months, the community has reached out to Governor Cuomo via voicemails and letters and thus far, has gotten no reaction. Nardiello reminded all that none of our local elected officials have called on our Gov. 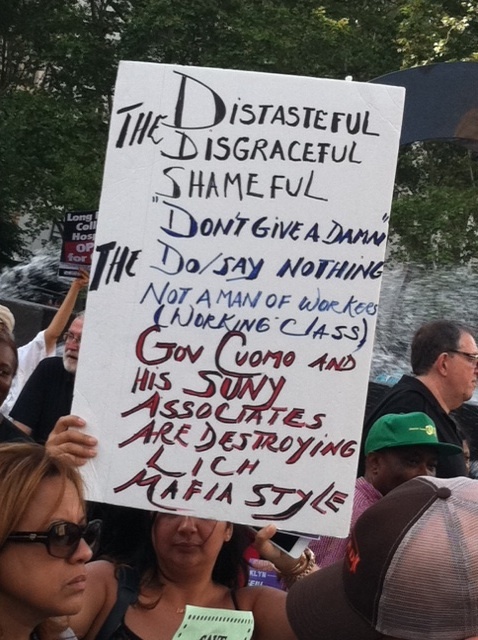 Cuomo by name for response, and on-record review of what his own appointed Board at SUNY Downstate is doing (headed by Carl McCall) – when they typically will line-up in unison at bus stops to protest easier targets like the MTA. Nardiello wondered if they are favoring party-lines and protecting self-interests relative to the governor’s anticipated 2016 run for the White House, over the life and death issue that’s very much at hand for LICH.